Chevre, Pesto and Honey Salad, easy summer salad from Thyme for Cooking. This is based on a salad we had this summer, but I used fresh tomatoes rather than stale croutons as a base for the cheese. Put 2 tsp olive oil on a small plate and bread crumbs on another small plate. Using your fingers, dip each tomato slice into oil, then bread crumbs. Heat remaining 2 tsp oil in a nonstick skillet. Add tomato slices and fry 3 - 5 minutes per side, until light brown. Drizzle 1 tsp honey on each tomato slice. Top with 1 tsp pesto and 1 slice of goat cheese. Remove skillet from heat and cover, just until cheese is warmed and starts to melt. While cheese softens, make the salad: In large bowl whisk vinegar and mustard. When incorporated add spinach and basil. Toss well to combine. To finish: divide salad and arrange on two plates. 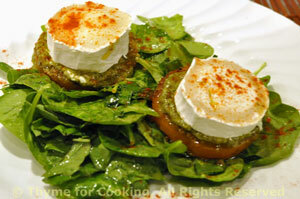 Top each salad with two tomato / goat cheese 'croutons', sprinkle with paprika and serve.